See the English translation of the Workers' Party chief's rally speech in Mandarin HERE. It's good that WP chief realises that people are beginning to view that Party as an arrogant one. 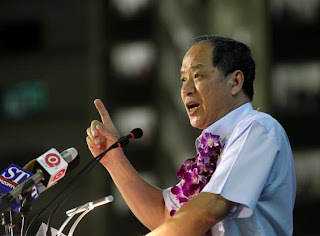 But at best, Low Thia Khiang is only fudging the issue. When the opposition sympathisers/supporters say that they want 'opposition unity', they don't mean they want all the opposition parties to have the 'same views and approaches to policies'. They are actually saying that they want opposition cooperation. It is in this spirit of opposition cooperation that SDP and RP invited WP to negotiate before this by-election. An invite WP rebuffed because that Party 'insists on going its own path', and not cooperate. The way WP has reacted to SDP's and RP's request to cooperate before the by-election, the way WP's candidate from GE2011 has described another competing opposition candidate's online rally videos as being 'strong competition' for mrbrown's parody videos, the way way WP's supporters had called Desmond Lim 'pig' at the nomination day, the way WP supporters unfairly attack any criticism of WP online, only reinforces that the Party is an arrogant one. But it's good that the WP chief has come out and openly said that 'given Singapore’s current political climate, to want all the opposition parties to form a unified force is an impossible goal'. Opposition supporters/sympathisers can now better understand why other opposition parties will have to challenge and compete not just with the PAP, but also with the Workers' Party now.